Kinston, North Carolina - The Down East Wood Ducks announced earlier today they have entered into a five-year partnership with Alpha Media. The agreement designates WRNS AM 960 as the Official Flagship Home of the Wood Ducks. WRNS AM 960 will broadcast all 140 regular season and any postseason games live beginning this season and continuing through the end of the 2021. "We are so happy to be partnering with Alpha Media for the next five seasons and to continue the tradition of Kinston's professional baseball team's broadcasts airing on WRNS-AM 960," said Wade Howell, Wood Ducks General Manager. As part of the agreement, other Alpha Media stations, including WRNS-FM, WERO Bob 93.3 FM, WXQR-FM, and WQSL-FM, will serve as Official Media Partners for select Wood Ducks season long promotions. "This is a great day," said Alpha Media Market Manager Tony Denton. "We are proud to partner with the Down East Wood Ducks in promoting and marketing the team throughout eastern North Carolina on all our Alpha Media Stations. As part of the partnership, we have invested in a new state of the art transmitter and audio processing equipment that is scheduled to be installed before the season begins. We will also have another exciting announcement in the coming days for WRNS - AM." 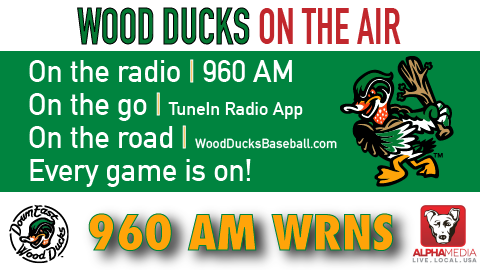 The broadcasts will begin on Thursday, April 6th as the Wood Ducks hit the road and take on the Salem Red Sox in the first regular season game in team history. The broadcast starts at 6:55 p.m. with first pitch scheduled for 7:05 p.m. Dominic Cotroneo, "Voice of the Wood Ducks", will call the action. All broadcasts will begin 10 minutes before the scheduled first pitch. Follow the team on Twitter @GoWoodDucks, Facebook.com/GoWoodDucks, and Instagram @GoWoodDucks. Team offices are open weekdays from 8:30 a.m. until 5:30 p.m. The Team Store is open weekdays from 11 a.m. - 4:00 p.m.